The 2015 British Basketball League play-off final at London's O2 Arena on 10 May is to be shown live on the BBC Sport website and BBC Red Button. It is the league's showpiece event and the finale of an eight-month season. "The BBL is honoured to have secured a broadcast partner for our play-off finals," said chairman Ed Percival. BBC executive editor Ron Chakraborty added: "Basketball is a popular sport and we're pleased to be bringing audiences to the play-off final." The game tips off at 16:00 BST. 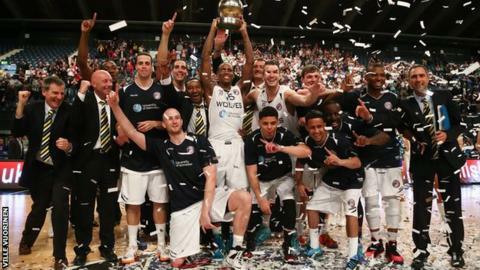 Worcester Wolves won the 2014 final, beating Newcastle Eagles 90-78 at Wembley Arena.